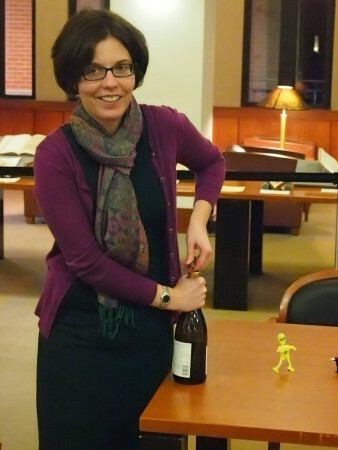 Shortly before Hallowe’en on October 21, 2015, the Jacob Burns Law Library and the Academic SIS of the Law Librarians’ Society of Washington, D.C. (LLSDC) hosted a Witchcraft & Wine reception in the Tasher Great Room of the Law Library. Immediate Past President of LLSDC Mary Kate Hunter opens a bottle of red to kick off Witchcraft & Wine. The in-house witchcraft expert, Library Director Scott Pagel, the Director of Special Collections, Jennie Meade, and the Reference/Legal History & Rare Books Librarian, Karen Wahl, mounted and attended a display of rare books from the Law Library’s Special Collections. The books chosen for the display fell into one of three categories: works advocating the prosecution of accused witches, such as the 1495 edition of the Malleus Maleficarum by Heinrich Institoris; works opposing the prosecution of witchcraft allegations, such as a second edition from 1632 of the Cautio Criminalis by Friedrich von Spee; and several notable witchcraft trials such as Histoire des Diables de Loudun (1693). 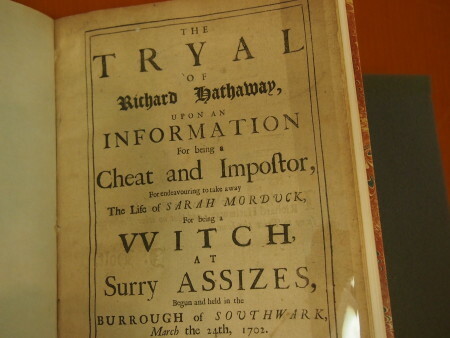 Title page from The Tryal of Richard Hathaway (London, 1702). 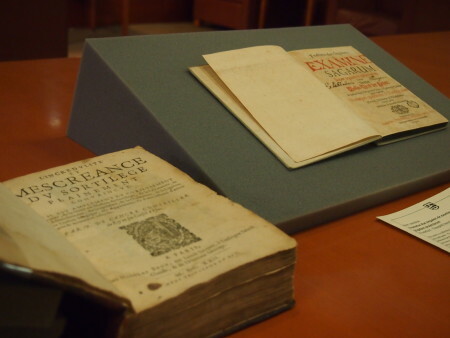 Left: L’incredulité et mescreance du sortilege (Paris, 1622); Right: Tractatus duo singulares de examine sagarum super aquam frigidam projectarum (Frankfurt and Leipzig, 1686).